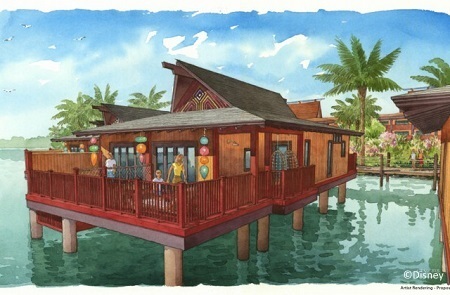 POSTED: Wed, 12/24/2014 - 06:00 | POSTED BY: Traci C.
Disney recently released the artist rendering for the new Disney Vacation Club Bungalows at Disney's Polynesian Village Resort. The 20 bungalows are the first of their kind on Disney property and each bungalow sleeps up to eight guests. In addition to their South Pacific vibe, the bungalows as Disney's Polynesian Village Resort also feature a plunge pool that overlooks Seven Seas Lagoon. In addition to the 20 bungalows, Disney's Polynesian Village Resort will also be home to the largest Deluxe Studios at Walt Disney World. The 360 Deluxe Studios sleep up to five guests and each has the ability to connect to another Deluxe Studios. These rooms will each have a bathroom separated into two areas, just like The Villas at Disney's Grand Floridian. The Deluxe Studios will also have a kitchenette and extra storage space. Disney's Polynesian Villas and Bungalows will be available for rent by non-DVC guests when they are not in use by DVC members. The first phase of the villas and bungalows will open in 2015. I am so excited about this expansion and renovations, I can't wait to see it all for myself. The Polynesian Village has always been one of my very favorite Disney resorts. This looks amazing! We definitely will have to stay here.